A mass-shooting rampage in Kalamazoo, MI, on Saturday. Six dead. I see no reports of concurrent violence, and the body count is not very high, so we can expect that the Bloodbath Formula for the event chart will be weak. 1. Pallas ruler Saturn parallel Pluto. 2. Venus semisquare South Node. 3. 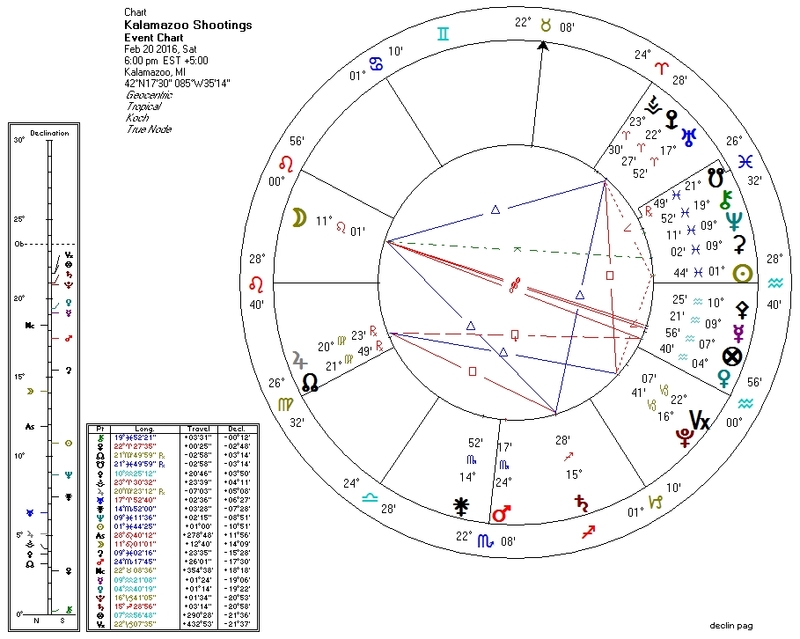 Venus ruler Saturn parallel Pluto. 4. Pluto rules Fourth House. Most of these aspects are relatively weak. If the data were available, I'm confident we'd see a Pluto-to-Pallas transit against the chart of both the city and of the perpetrator.